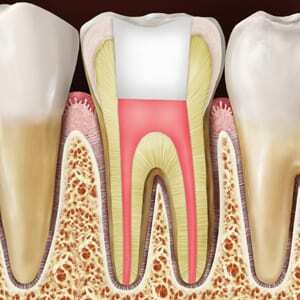 In fact, a root canal treatment relievespain caused by decay within a tooth. As decay progresses, it can enter the interior known as the pulp, which contains bundles of nerves and blood vessels. It attacks these nerves causing pain and infection. If the infection progresses through passageways known as root canals that are in the roots of the tooth, the pain can intensify. More important, the tooth is in danger of loss as the root and connective tissues that hold the tooth in place are injured from the spreading infection.